Have you ever dreamed of spending a night under the stars in a place where light pollution isn’t going to mar the view of the sky? Have you ever wished you could lie in bed and point out constellations in the night sky with your loved ones? How about doing both in an Eco friendly hotel near white sandy beaches, turquoise waters and spanning panoramic views of the coastline? If you’ve answered yes’ to the above questions, you are going to want to consider visiting one of the two beautiful bubble lodges found in Mauritius, an island located just off of the coast of south-east Africa. These accommodations are an incredibly unique way to experience the country. Let’s see where are these bubble lodges and what they each have to offer. This lodge is on a tea plantation in Bois Cheri. It provides visitors with views of an adjacent lake and a way to take in the night sky from the comfort of your bed. The rooms themselves are in a transparent bubble that provides sweeping views of trees. The restaurant located at this lodge will provide diners with gorgeous panoramic views of the south coast. These accommodations are installed on a wooden deck that has an outdoor shower and several spotlights that can showcase the beauty of local vegetation. Visitors to Bois Cheri can enjoy free activities like foot pedal boating, fishing for tilapia, hiking and bicycling. These accommodations are found on the picture-perfect island of Ile aux Cerfs near the east coast of Mauritius and can boast the fact that they are the first and only accommodations on the island. When you stay at the bubble lodge, you get access to a private jetty through the lagoon to get to the island. The accommodations here are elegant, comfortable and surprisingly spacious. If the phrase ky shower’ is something that interests you, you’ll love the experience of bathing at your bubble lodge accommodation. Visitors get private butler service, and they can celebrate special moments like anniversaries with meals on the beach or in the private garden for memory making. This bubble lodge will give visitors access to a private beach and free visits to the local championship golf course. If we haven’t yet wholly convinced you to visit one of the two stunning bubble lodges available on Mauritius, then perhaps learning more about what sets these accommodation types apart from typical resorts will. Sure, you might have a beautiful view from the balcony of your resort. However, can your hotel room provide you with a night under the stars? Can you lie in bed at night and find constellations with your spouse? The views at a bubble lodge are not only breathtaking but mind-clearing as well. Everyone can benefit from a little time in nature and stay in accommodations where lush forests and lake views surround you will provide you with that experience. Tourist resorts aren’t known for their environmental sustainability. These lodges have an Eco-design that provide renewable ecotourism with almost no impact at all on the environment. We can all benefit from a little fresh air, taking a moment to breathe in and enjoy our surroundings without the distractions of work, social media or the affairs of the world we live in today taking us away from what matters. 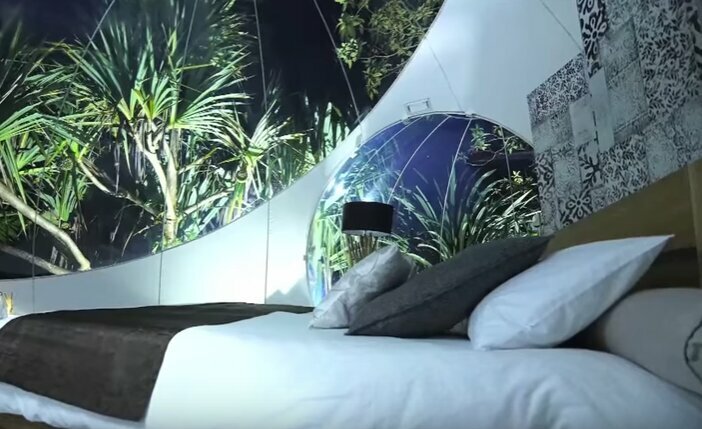 Staying in a bubble lodge feels a bit like a primitive experience in that visitors see and enjoy the beauty of nature with the bonus of not having to deal with heat, humidity, bugs or inclement weather that would typically come with other outdoor accommodations like tenting. Bubble lodges are a truly magical way of getting to experience Mauritius. They’re not only able to provide visitors with views of the beautiful landscape surrounding them, but also they can reconnect with themselves, their loved ones and with nature in an Eco-friendly atmosphere that is indeed once in a lifetime opportunity.